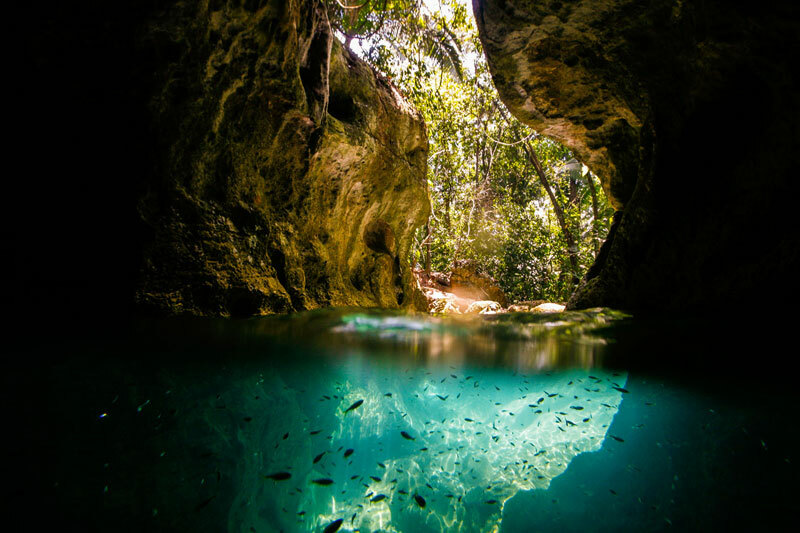 Although the landscape of Belize is dotted with hundreds of caves, probably the most famous one is Actun Tunichil Muknal, commonly known by locals as the ATM cave. Only rediscovered by modern archeologists 25 years ago, the more than three miles of cave tunnels and caverns were once used by the Ancient Maya to perform sacrifices and important religious ceremonies. Some people refer to the ATM as the Cave of the Crystal Sepulcher because one of the chambers in the deepest part of the cave is home to the remains of a young woman dubbed the “Crystal Maiden” because her bones have been calcified over the millennia, giving her an esoteric sparkling appearance. To reach the ATM cave, visitors must first arrive at the huge Tapir Mountain Nature Reserve. From there, guests must hike on foot for 45 minutes through the jungle, crossing over three streams and witnessing the natural beauty of Belize first-hand. Once at the cave, visitors must swim across a body of water to reach the entrance. Inside, due to the conditions of the cave, visitors are required to remove their shoes to explore the winding passages and slippery caverns in their socks. Although Placencia is located in southeastern Belize, it is definitely possible to do a day trip to ATM cave outside of San Ignacio with plenty of time to see all the wonders that the cave has to offer. The journey to Cayo District is spectacular thanks to the Maya Mountains which guests will see along the way. The tour to ATM Cave is a full-day experience, departing Placencia at 6:30 am and arriving back on the peninsula at 7:00 that same evening. One of the finest resorts on the Placencia Peninsula is Laru Beya, a luxury resort with rooms, suites, and penthouse accommodations right on the beach. Laru Beya features its own gourmet restaurant as well as gorgeous outdoor infinity swimming pools. Whether you’re interested in exploring the ATM Cave, the Maya ruins of Xunantunich, going cave tubing, zip lining, jungle hiking or horseback riding, the knowledgeable staff of Laru Beya can help arrange everything.